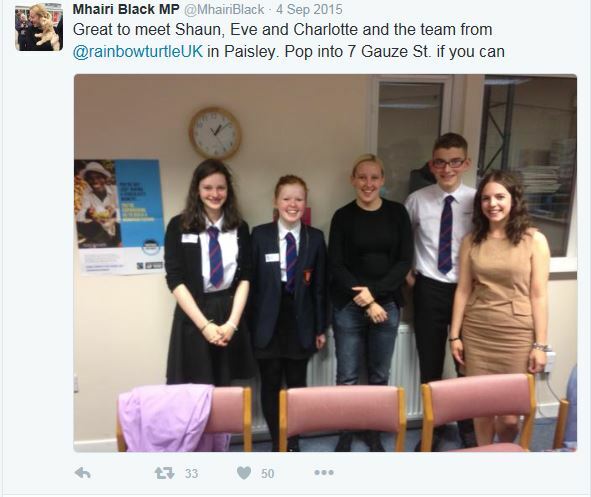 Three S3 pupils, met local MPs Mhairi Black and Gavin Newlands to discuss Fairtrade. 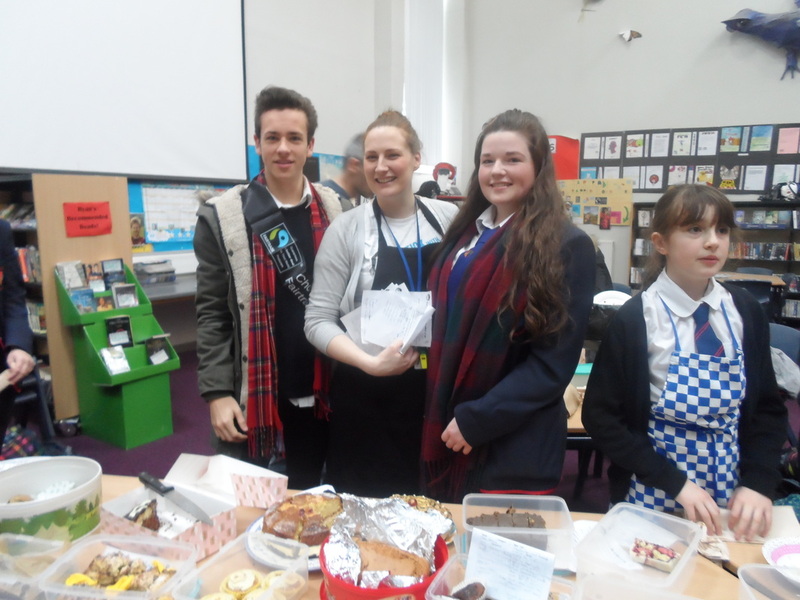 The pupils were able to exhibit that Gryffe supports Fairtrade and also explain some of the Fairtrade events that have taken place this year, along with future events. 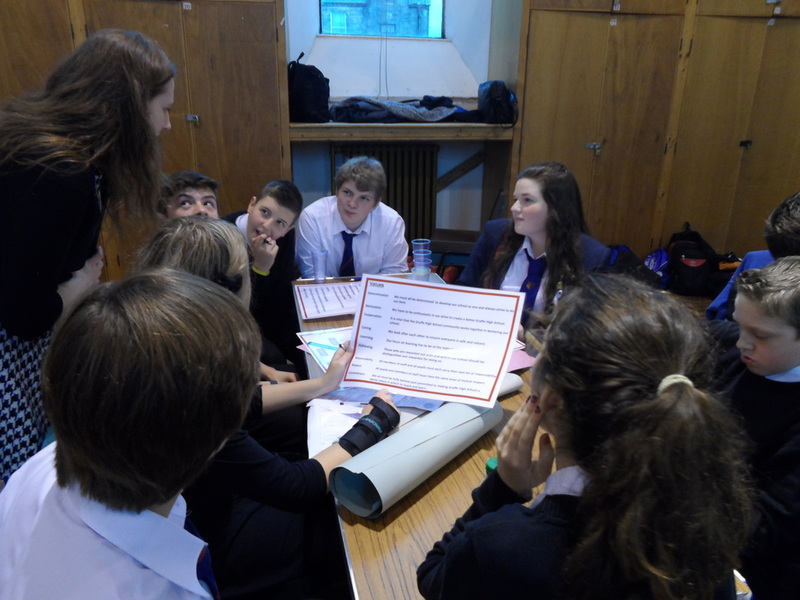 The pupils also asked the MPs questions based on the Sustainable Development Goals. Shaun asked how we hold UK companies accountable for their riches abroad. Charlotte asked how we can encourage UK businesses to sell and stock Fairtrade products and Mhairi was put on the spot by Eve who asked her how she was going to use her influence to promote Fairtrade. It was an enjoyable afternoon and hopefully raised the profile of Fairtrade with all of those present. 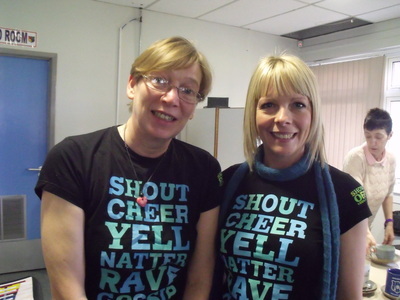 Our pupils were recorded and you can listen to this discussion on Rainbow Turtle’s podcast. After a fantastic Fairtrade Fortnight we have a lot of people to congratulate and thank! First of all, thank you to all staff and pupils for getting involved in the variety of events. A special thank you to all our 'Fairtrade Fighters' from S1 to S6 who helped run the activities - we literally couldn't do it without you. From our Great Gryffe Fairtrade Bake off, Fairtrade smoothie and banana split stalls we managed to raise a whopping £335! This will be match funded by the UK government - so it will be doubled to £670. We think this is a massive achievement and couldn't be prouder of the Gryffe High School community. 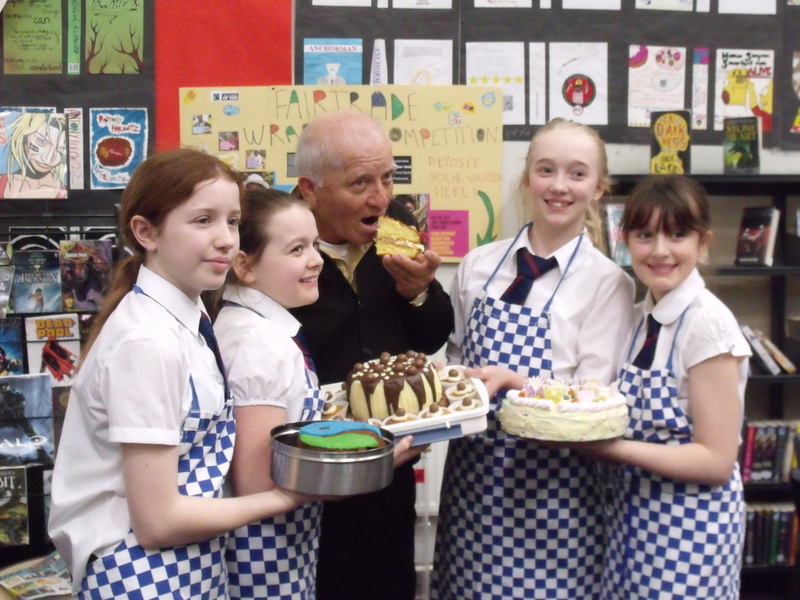 Above are some pictures from across the Fortnight, including our Bake off winners, banana splits, Fairtrade trail, Fairtrade wrapper competition and the Renfrewshire Council Local Authority Fairtrade Steering Group meeting which was hosted by Gryffe on Thursday 19th March. The Bake off winners were: Codi Carswell, Thea Raeburn, Hannah Brummitt and Nicole Hagen. The girls were then finalists at the Renfrewshire Council Bake off the next day - well done girls for getting on so well! Our school winners were Lucy Cameron, Laura James, Emily Svensson, Logan McBride, Laura James and Emma Ross (not pictured). Their cakes and bakes included a fantastic Victoria sponge, chocolate brownies, banana muffins, to name but a few. Well done! The Fairtrade smoothie and banana split storm went down very well with staff and pupils alike. Our 6th Citizenship Committee members did an excellent job at promoting the goodies and ofcourse contributed greatly to the overall amount raised. The S1/2 Fairtrade wrapper compeition was a close call, but Burns house won out in the end and Blair Tate from 1Bn claimed the Fairtrade Easter egg prize for collecting 23 wrappers in total - well done, Blair! Megan Lovett of 1M won the S1 Fairtrade Trail competition. She correctly identified the number of Fairtrade sugar producers worldwide by going around the school and hunting down the posters. This was a sneaky numeracy task as pupils had to add up all the numbers from 15 different posters to get the right number of producers! Well done, Megan! Renfrewshire Council Local Authority Fairtrade Steering Group meeting which was hosted by Gryffe on Thursday 19th March. This was a fantastic opportunity for the school to showcase some of the events that we had done across the Fortnight. 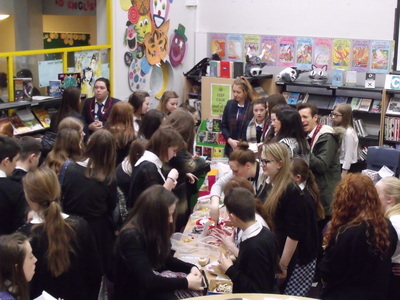 We welcomed over 25 guests including other schools, Councillors and local Fairtrade groups. Some of our pupils did an excellent presentation and Miss Rowan put together a fabulous video with pictures, music and soundbites. 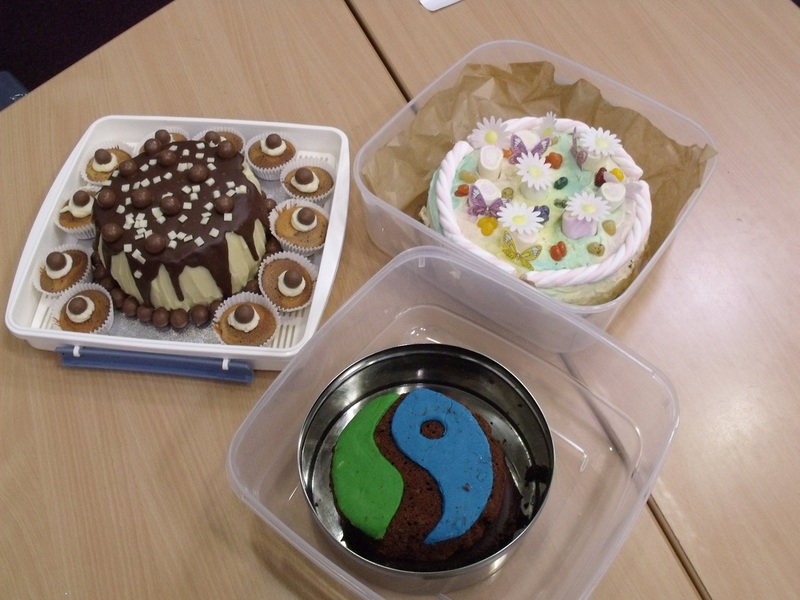 Some of our Fairtrade Fighters also went above and beyond to make some lovely cakes for our guests, include Fairtrade banana pancakes, swiss roll and cupcakes. As ever, we are continuing our efforts throughout the year to ensure that we remain a FairAchiever School. We look forward to more opportunities to include Fairtrade events, activities and lessons for the remainder of the session. Great Gryffe Fairtrade Bake Off! 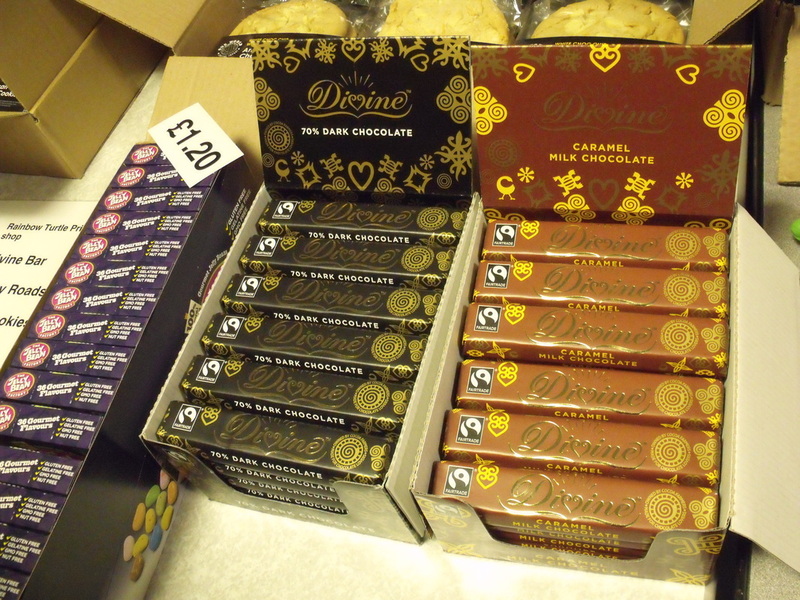 Friday 27th February was a busy day marking the middle of Fairtrade Fortnight. The day started with a presentation in the theatre from visitor Ismael who is a Producer (of Honey) in Guatemala. Pupils and staff were also encouraged to show off their Fairtrade label. 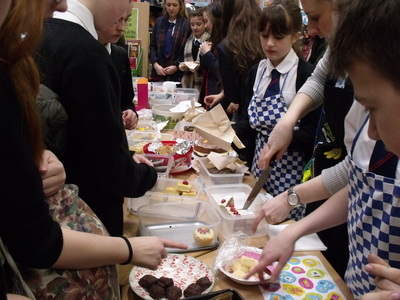 Mrs Davey and Miss Rowan organised the day which included a Great Gryffe Fairtrade Bake Off. There was a competition for Pupils and Staff. The enthusiasm from both pupils and staff was amazing. Mr Gibb in Biology proved a Staff winner with his Lime and Courgette cake baked using Fairtrade sugar. 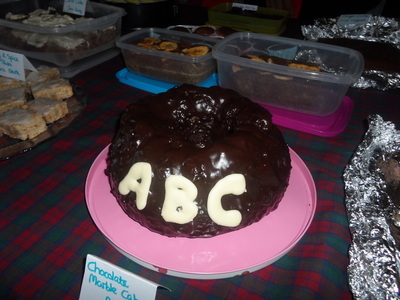 Staff enjoyed this at the Big Brew at interval, along with a great range of baking from other staff, including a personalised entry from the ABC department. First year pupils responded really well to the Great Bake Off Opportunity. Four first year pupils Codi Carswell, Nicole Hagen, Hannah Brummitt and Thea Raeburn were winners with their superb cakes. Their cakes were so attractive that the pupils have been invited to Renfrewshire Council’s Big Brew event on Saturday 28th February. Other winners from the competition included Lucy Cameron, Laura James, Emma Ross, Logan McBride and Emily Svensson - all from S1 - Well done to you all! Thank you to all who supported a great Fairtrade day! 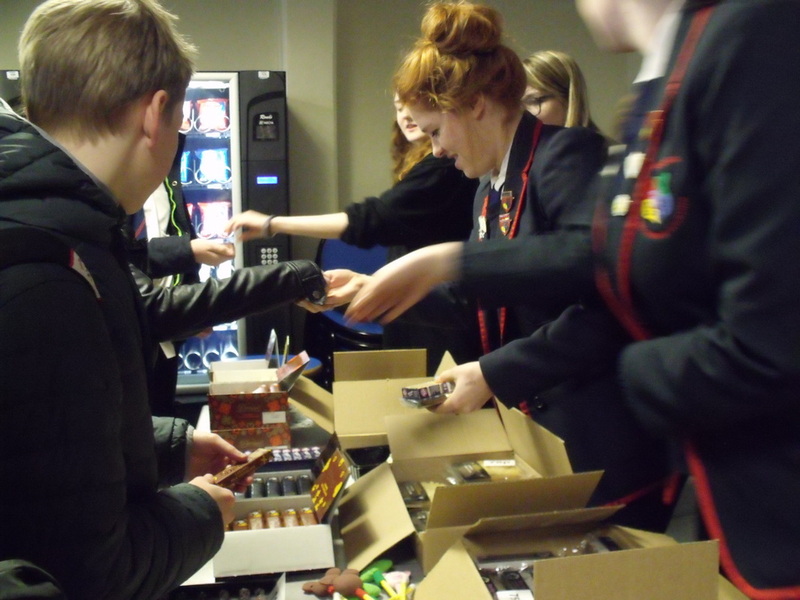 At Gryffe High School we pride ourselves on our contributions that we make to Fairtrade, not just during Fairtrade Fortnight but throughout the year. 2015 is no different and we are excited to offer a range of events and activities during Fairtrade Fortnight to encourage our staff and pupils to fully participate in making conscious choices that can make a difference in the world. Since the first Fairtrade Fortnight in 1995, the Foundation have been educating the public on why to choose Fairtrade and increasing sales on Fairtrade terms for marginalised producers. Over the past 20 years the Fairtrade mark is now the biggest and best known ethical label in the UK. Fairtrade was launched this year at our monthly year-group assemblies, linking into our Rights Respecting Schools Award, with a focus on the Right: ‘You have the right to protection from work that harms you, and is bad for your health and education. If you work, you have the right to be safe and paid properly.’ Article 32, United Nations Convention on the Rights of the Child. Our pupils learned that if a child is born in another country where they have to work on their family’s farm just to make enough to provide food, then it may be that this Right, which all children have, is not met. By thinking about how Fairtrade can make a difference to children and their families across the world, we are furthering our efforts to be effective global citizens. Fairtrade Fortnight has a key focus every year and this time it is on ‘core commodities’ such as sugar, cocoa and tea – products we all have in our cupboards at home and use almost every day. The price of raw cane sugar has been driven down by almost 30% in recent times by big brands such as soft drinks companies. This of course has a dramatic effect on the price that farmers are paid for their produce, and in many cases it does not give them enough money to feed, clothe and educate their children. As consumers, we can opt to make a difference by buying Fairtrade products. To promote the use of Fairtrade sugar, we are holding our Great Gryffe Fairtrade Bake Off on Friday 27th February. All pupils and staff have been asked to participate by bringing in sweet treats which will then be judged and sold throughout the day. We are also delighted to welcome Ismael – a Fairtrade honey producer from Guatemala, as our guest judge! He will be accompanied by other VIPs – members of our local community Fairtrade groups. • S1/2 Fairtrade wrapper competition – across the Fortnight, collection point in the library – prize for the person with the most wrappers! • S1 Fairtrade trail – seek out the posters around the school and hand in entry forms by Wednesday 4th March – black tokens for all entries, and prize for the winner drawn from correct entries. As part of our journey to becoming a Rights Respecting School we are required to put together a School Charter – this is a document that is made by pupils that will inform the actions of everyone within the school, pupils and staff. At its core are the Rights that pupils have chosen which best suit school life. These are taken from the United Nations Convention on the Rights of the Child. 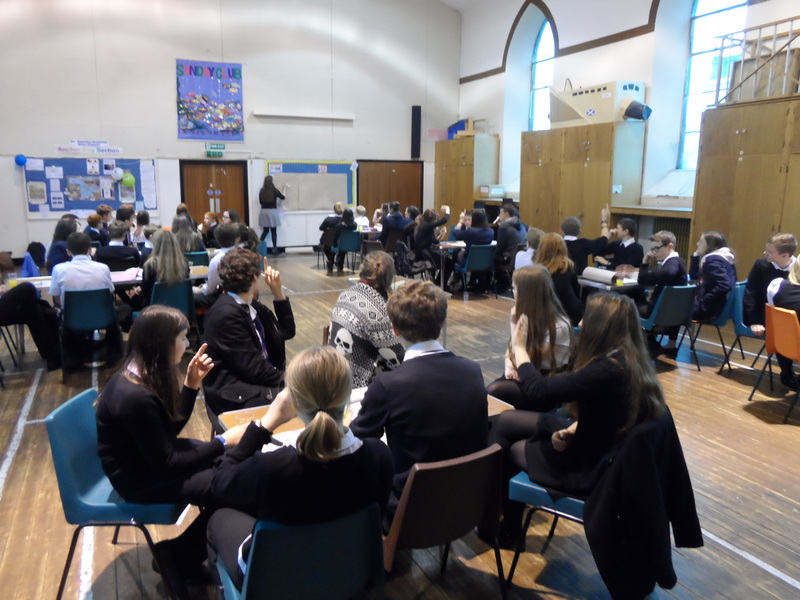 Following this consultation, members of the pupil council and RRSA steering group were invited to two afternoon sessions in the Church Halls where the content of our Charter would be decided. This involved looking at the results from the pupil consultation – pairing Rights with actions; considering our school aims and values, and how these could link to our Charter; as well as deciding on how our Charter would look. The pupils involved were all very enthusiastic and came up with some super ideas! These have then been translated into our final School Charter, which is shown below. The Charter has since been approved by the Parent Council and school staff – as this is an agreement that must be formed between everyone in the school and the school community. • Indicate what must be done to ensure these Rights are upheld. Young people have all of these Rights highlighted – pupils and staff must follow these actions to ensure an individual’s Rights and those of others are met. This is everyone’s REPONSIBILITY. We hope to work towards our assessment for the Rights Respecting Schools Award in the coming months. We will continue to survey pupil opinion to ensure that we are on track and promoting the Rights of everyone. On Thursday 22nd of January two members of staff and two S2 pupils, Georgia Black and Emily Irvine, attended the Renfrewshire Fairtrade Steering Group. The meeting was attended by council representatives, local councillors and members of the community from local Fairtrade groups. Gryffe were the only school in attendance and were given a warm welcome by the committee! The meeting focused on various Fairtrade issues from integrating Fairtrade into the curriculum to the possibility of introducing a Renfrewshire Secondary School Fairtrade Trophy. The majority of the meeting was spent discussing the upcoming Fairtrade fortnight. We had the opportunity to share what Gryffe are doing to support this event. We were also able to hear what other members of the community have planned for this fortnight. The councils focus this year is a Bake Off event which they are hosting on Saturday 28th February. Members of the community are encouraged to show off their baking skills by whipping up some delicious treats using fairtrade products. Gryffe will be hosting its own Bake off in school. Hopefully our winners will be able to represent the school at the councils event. Emily Irvine, S2, said attending the meeting ‘was a great experience’. As part of the 70th anniversary of Auschwitz being liberated (27th January 2015) Scott Martin and Georgina Milnes, the schools two S6 ambassadors for the Holocaust Educational Trust held assemblies for every year group to share our experience of Auschwitz. These assemblies were aimed to help us remember those who were persecuted during World War 2 and to prevent a horrific act such as the Holocaust from happening again. However despite our attempts, such acts of genocide still do occur today. As part of our assemblies we shared a poem read to us at Auschwitz, which brought home the horrors of the camp and the atrocities of the war in which the Nazis carried out several terrible acts of war crimes. Five by five they walk down the street of Arrivals. It is the street of Departures but they don’t know. It is a one-way street. so as not to be faulted for anything. They reach a building and heave a sigh. They have reached their destination at last. cautiously not to wake them all at once. And when each is handed a towel they worry whether the shower will be warm because the children could catch cold. the women hide the children against their bodies. And perhaps at that moment they all understand. On Thursday 13th November, 20 pupils from each year group got the opportunity to visit the Reflections Room which took place in the Conference Room. The Reflection Room was set up by members of staff and members of the local community to show pupils the importance of the effects of World War One and the reasons behind Remembrance Day. In the Reflection Room there were many different stations filled with stories of soldiers, games and War poems. The first station we came across was a game with cards laid out in a circle, and the aim of the activity was to see how easy it is to forgive somebody no matter what the situation may be. As we progressed through the game, we started to realise that it becomes hard to forgive and forget when the situation is as ­­­agonizing as World War One. The second station that we approached was the story of a young soldier who fought for his country on the front line. The story of the young soldier tells us what the conditions were like in the trenches. Then we were informed that each soldier owned a small box and which they filled with letters they had received from family and friends back home. Every soldier was given a pocket sized bible which a lot of them kept on them at all times during the War. As a gift from Princess Anne, all soldiers received a brass engraved tin which contained tobacco and cigarettes for the older soldiers, the younger soldiers received sweets in their tin and all the nurses on the frontline received a tin of chocolates. When reading the letters it put it into perspective that World War One did actually occur. Some letters were filled with light hearted jokes and others were filled with sad but loving words from the families back home. As we read through some more letters we both began to realise how important family and friends are in every day life and we shouldn’t take them for granted because we never know when we are going to lose them. As we progressed through the stations we came across a map of old Bridge of Weir, it was filled with black dots which represented the soldiers who died as a result of World War One. When looking at the dots we soon reslised that there was more than one dot on some of the houses. This signified that in a household there could of been more than one family member who fought for this country. The last station we reached was a chance where you could write your own prayer/message to the troops that have fought and to the troops that are still fighting today. When reading many of the prayers and messages that some people had left it showed us how people still care about the fallen soldiers and will continue to care for wars that still take place today. In conclusion, we really enjoyed the experience we were given and grateful for this opportunity. The Reflection Room was a great way to get the community involved with the school and with the pupils. We had a very informative afternoon but yet still very enjoyable. ﻿Every October at Gryffe High School we have our annual celebration of Global Diversity. This involves all departments across the school and whole school activities at intervals and lunchtimes. Pupils will learn about various cultures, individuals and groups from across the world that contribute, or have contributed to the global society, of which we are all a part of. This year, some of the lessons which pupils will be engaging in are: Music from across the world – Jamaican steel drums, Brazilian samba and African Blues; Geography – India country study, and diseases affecting developed and developing countries; Health and Food Technology – cuisine from around the globe; Science – a variety of topics looking at contributions of scientists from many different countries. This gives you a small taster of just a few of the things happening across the school. As part of Curriculum for Excellence, Global Citizens and Citizenship are some of the key contexts which underpin the framework for learning. At Gryffe High school we pride ourselves on our continuing endeavours to ensure that all pupils are global citizens, and this is further strengthened by our focus on Global Diversity during October. 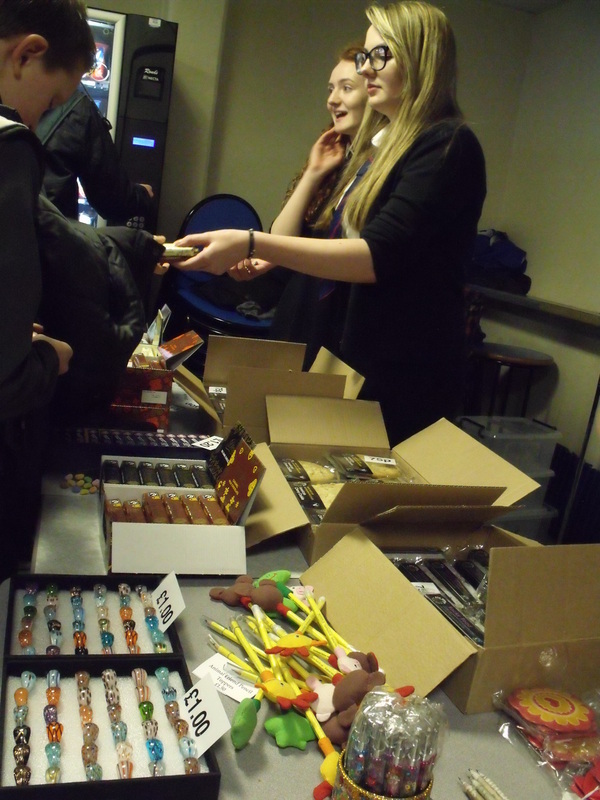 The Rainbow Turtle Fairtrade stall was in school on Friday 24th October at lunchtime selling all sorts of fantastic Fairtrade goodies – many pupils and staff took the opportunity to get ahead with some early Christmas shopping. S2 Africa Assembly – S2 pupils reinforced their in-class learning from ABC and Social Subjects by participating in an African Quiz; learning about French-speaking African nations; looking at African artwork; and hearing some fantastic African music. Two S6 girls, Rachel and Kadey also stopped by to tell us all about their upcoming World Challenge expedition to Tanzania and up Mt. Kilimanjaro in June. We wish them the very best of luck! Ross Laird, 4Mk, was our Gryffe High School winner for the 2014 Inspire>Aspire competition. He then went on to win a bronze award at the national finals and part of his prize was tickets to the Commonwealth Games Closing Ceremony. Ross has received further recognition for his efforts by being featured in the Awards magazine. We are delighted Ross continues to be recognised and are proud that our Gryffe High School pupil will be forever immortalised in print! This is a perfect opportunity to launch the Inspire>Aspire competition for 2015. The theme, once again, is Global Citizens in the Making – continuing the legacy of the Games in Glasgow 2014. Pupils are invited to complete a poster looking at their own values, Curriculum for Excellence Four Capacities, and also the four outcomes of the Games in section 1. Section 2 encourages entrants to think about their favourite fictional character and how this person offers lessons for life. You also have the opportunity to think about an inspirational figure whose actions and achievements inspire you (Ross chose the Dalai Lama – a man whose life has been full of adversity but he still continues to promote peace, freedom and understanding). The final section is ‘My Arc of Destiny’ – your vision and commitment to making the world an improved place. This includes detailing the kind of person you wish to be and your vision for a better world. We would encourage as many pupils as possible to take part in this competition – and we imagine the prizes will be equal to, if not better than Commonwealth Games tickets, this year! You are a global citizen and this competition encourages you to think about the wider world we live in, possibly spurring you on to action – similar to that of great inspirational figures. Entry forms are available from Mrs Davey (RMPS). Deadline hand-in date is Friday 24th April. The National Awards Ceremony is held in early June. Good Luck! Thank you once again to pupils, parents and teachers for helping our annual Operation Christmas Child Shoebox Appeal. This year we managed to get in and send off 207 boxes and £133 raised from our ‘Shoeday’ – this will help the cost of the transportation of boxes. It is a fantastic achievement for the school and we could not have done it without your help. Can we also note a special thanks to those pupils who gave up their own time to help us check boxes to ensure they were sent off in time. This Christmas, you have helped made a difference to so many children across the world who would not otherwise receive a Christmas gift. These gifts will undoubtedly bring joy and happiness to children, in otherwise difficult situations – many of whom will be victims of war, famine and homelessness. At Gryffe High School we pride ourselves on your charitable efforts, but also our awareness of our advantaged position. We are global citizens who CAN make a difference in the world we live in, no matter how small. We recognise that all children, no matter where they live have the Right to be well cared for, as well as the Right to play and leisure time (Article 31, United Nations Convention on the Rights of the Child). Welcome to our shiny, new Gryffe High School Citizenship and Rights Respecting School blog! Here you will find information about what we have been up to recently - whether that is promoting the Rights of young people or whole school Citizenship events. Citizenship is a main focus for Gryffe High School as Curriculum for Excellence promotes understanding and awareness of becoming a Global Citizen. CfE requires Glbal Citizenship to be embedded across the curriculum through the core values of wisdom, justice, compassion and integrity. We hope you find the information here useful and interesting. Should you have any suggestions about how we make our site better, please get in touch. 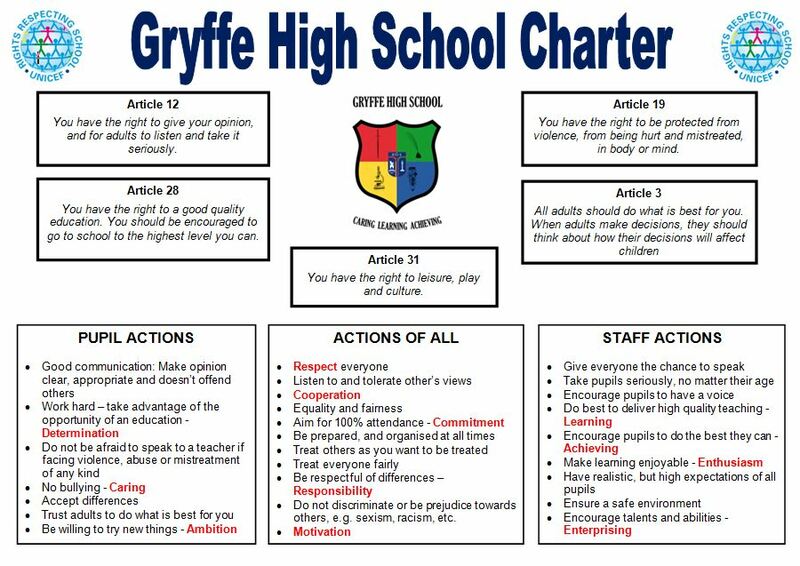 Citizenship is a main focus for Gryffe High School as Curriculum for Excellence promotes understanding and awareness of becoming a Global Citizen. CfE requires Global Citizenship to be embedded across the curriculum through the core values of wisdom, justice, compassion and integrity.